Able to move only her head, eyes and mouth, Hilary Lister acheived her dream to sail solo across the English Channel on Tuesday, August 23rd, 2005. Overcoming severe physical pain to navigate her boat unaided through one of the busiest shipping channels, Hilary Lister became the first quadriplegic to sail, single-handed, across the English Channel, from Dover to Calais. Hilary sailed into the record books in 6 hours and 13 minutes and the story hit the frontpages of newspapers worldwide. It was the first time a quadriplegic sailor had crossed the Channel and was the longest solo voyage ever, by a quadriplegic. 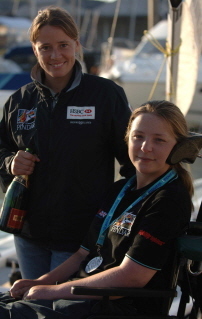 Meeting Emma Sanderson (neé Richards) at the London boatshow in January 2005, proved to be a stroke of luck. 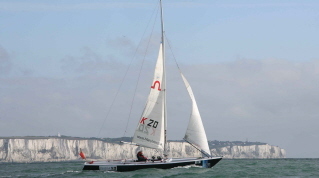 With Emma’s sponsors (Pindar) onboard to help Hilary achieve her dream, a boat was found and altered to allow Hilary to sail her. A device consisting of two plastic straws was put on the boat and hooked up to the winches of the boat. This allowed Hilary to steer and control the sails by sucking and blowing into the separate straws. Hilary named the 27’ boat Malin (after her nephew). After months of planning, and preparation by Hilary, and the team from Pindar and Westbere Sailing Opportunities, Hilary was in Dover, on stand-by for the right weather window for her attempt to cross the channel. The call to sail came on the morning of 23rd August 2005. At around 8 in the morning, Hilary, alone on Malin, left Dover Harbour and they were soon heading away from England. Hilary had support boats and friends nearby but, she wasn’t looking at them. She was on her way to France!